ARTnTHAT: Scottish Fashion Awards 2013 Nomination - Matt Russell Scottish Fashion Graduate of the Year Nominee. Scottish Fashion Awards 2013 Nomination - Matt Russell Scottish Fashion Graduate of the Year Nominee. I am so honoured to announce that I have been nominated for a Scottish Fashion Award, as Scottish Fashion Graduate of the year 2013. You can check out my full bio and all the nominees here. The event, which will be hosted by style icon Laura Whitmore (MTV) on 9th October in London, recognises the most influential Scottish players in fashion, working in Scotland and around the world. 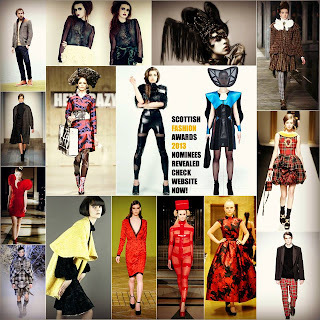 It also provides an unrivalled platform for new and emerging talent hailing from Scotland and is attended by influential industry leaders, designers, models, retailers and celebrities and celebrates the best of what Scotland has to offer in fashion, design and textiles. A host of those such as Christopher Kane, Jonathan Saunders, Holly Fulton and Louise Gray who are establishing our fashion future - I cannot believe I will be walking amongst my Idols in the Fashion Industry. Nominations were selected from leading figures in fashion. The finalists will be judged by an exclusive panel made up of professionals from the world's leading fashion houses, the most renowned and respected fashion publications and leading figures in style with winners announced at the glittering awards ceremony at the plush Dover House. Moving to London for the first time the invitation only awards ceremony will be made up of a nominee catwalk show and award presentation hosted by TV personality Laura Whitmore followed by a glamorous after party at a secret location. It is such a privilege to be recognised within the Fashion industry and to be listed alongside my idols and be mentioned on Vogue, Elle and Drapers. It really has made launching my graduate collection on Friday the 14th June so much more exciting! My graduate collection will be launched on Friday the 14th June at Grays School of Art before being taken to New Designers Exhibition in London. My online shop Artnthat studios will go live from 7pm on the 14th June but I will keep you posted. Greetings! Thank you for inviting me right proper here. I found such pretty some interesting thoughts proper right proper here. Your writing style might be very smooth and i actually experience to analyzing your posts.